Previously in 16th-century brown calf with rubbed painted arms of Emperor Charles V; lettered: Liber precum / Caroli Quinti / Imperatoris / Anno / (illegible, 1533? ), in brown morocco case; replaced with modern buckram clamshell binding, July, 2001. Made for the use of Emperor Charles V and one of his chaplains, a member of the Pot family (arms, mottoes, portraits of Emperor throughout; portrait and arms of cleric on fol. 35v: quarterly, 1-4, azure three six-pointed estoiles argent; 2-3 or a fesse azure, in chief a label of five points sable); Sir Francis B. Palmer Collection (Burlington Fine Arts Club, illuminated manuscripts, 1908, p. 115-116, no.237, plate 147); purchased by J. Pierpont Morgan (1837-1913) from Jacques Seligmann in Paris in 1912; J.P. Morgan (1867-1943). 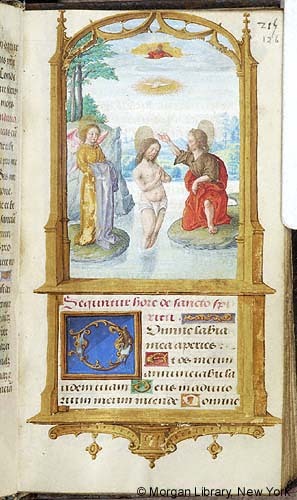 Ms. book of hours for the use of Rome (Hours of the Virgin); written and illuminated in Belgium, probably in Brussels, and dated 1533 at the bottom of the architectural frame on fol. 18v). Scribe: F. Gratianus Brux, who has signed the colophon on fol. 266. Artist: Master of Charles V.